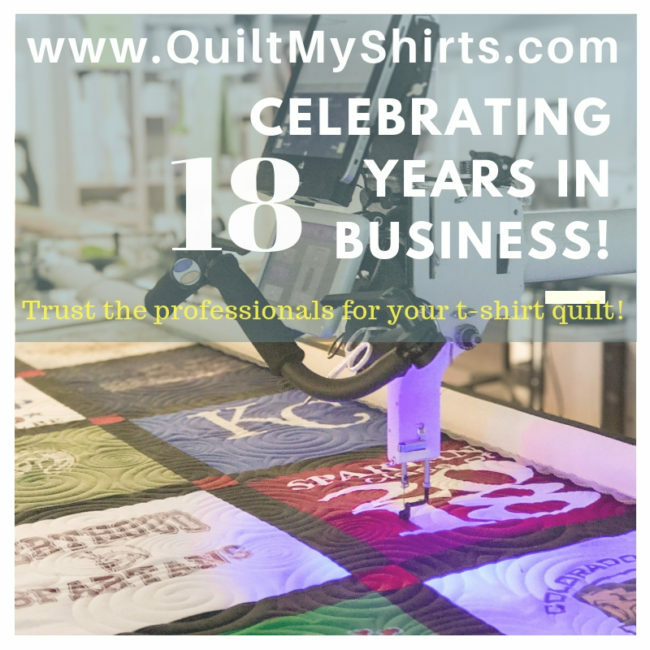 | Quilt My Shirts | Premium T Shirt Quilts | 18+ Years in business!
" It is gorgeous beyond belief and worth every penny! .... I am so stunned by how fabulous it looks "
My NWFolklife Festival T-Shirt Quilt arrived today. It is gorgeous beyond belief and worth every penny! The NWFolklife Festival, taking place over Memorial Day weekend in Seattle, WA, is the largest donation-driven, multicultural festival of its kind in the USA. It is music,dance, and food, and crafts from all over the world and the US. I have been volunteering as a fund raiser with it for the past 24 years. The T shirt designs are by local students and artists. The festival is my Christmas in May, and not to be missed. As you can imagine, this quilt means the world to me. I am so stunned by how fabulous it looks, I had to write to you immediately and tell you. I am so glad I made the decision to get it made with your company!
" The positive testimonials were all TRUE !" I want to let you all know that the US Navy SeaBee shirt quilt you made was a big hit. Leslie has it on her lap almost every day. I was impressed with how it came out - the positive testimonials were all TRUE! I expect to have another done some day (probably Boston Red Sox shirts or Matt Kenseth NASCAR shirts). I have shown it to everyone I know and gave your info to all interested parties.
" It was perfect. My daughter loved her quilt ..."
I just wanted to say thank you for doing such a beautiful job on the quilt. It was perfect. My daughter loved her quilt and said it was exactly how she wanted it to look like. Thanks again!!
" Unbelievable! I am absolutely stunned with the quilt "
Unbelievable! I am absolutely stunned with the quilt. The pictures of others and testimonials are so true, but words cannot describe what it looks like in person! Our principal is retiring after 43 years in education and our chorus is presenting this to her, she is going to love it!! What a perfect way for her to remember this chapter in her career. Thank you so much! I look forward to doing business again with you. My son loves his quilt we gave him for graduation! My son loves his quilt we gave him for graduation! He can't stop looking at it and smiling. You guys did a beautiful job! We will definitely be making two more in 4 years when our twins graduate! And, no, he's not standing on a chair. He's 6'10"! The twin XL is perfect for him! The quilt is even more amazing than I expected! Thank you so much, what a wonderful keepsake for my son. Love love LOVE it!! I just received my 2 quilts that I had made for my two adult kids for their Christmas presents this year. I am so pleased with them.....no....I am speechless on how beautiful they came out. I am showing everyone (except my kids)!! 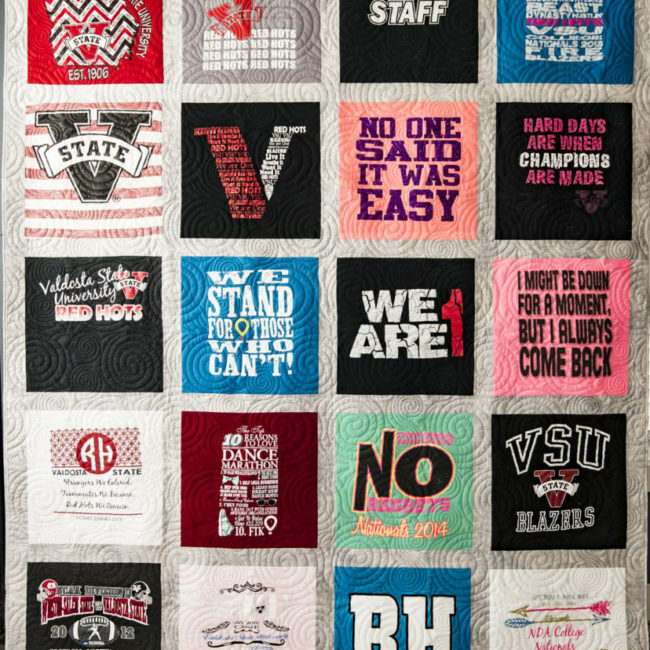 I looked and looked on line to find a place that could make these quilts, because I did not have the talent or time to make one myself and I just didn't want a quilt that just had the tee shirts sewn on them. The way these were made will last a lifetime if taken care of properly. Linda and team, thank you for helping to make the perfect gift for my kids!! 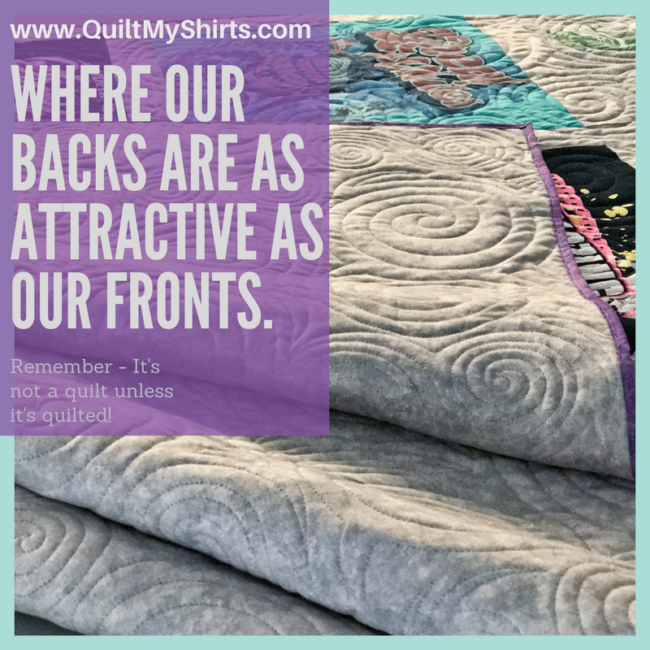 I could barely contain myself when the quilts arrived, and once I saw how beautiful crafted they were, I couldn’t stop the tears. 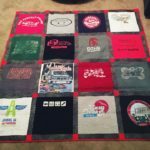 I ordered the quilts for my husband, son, and niece in memory of my son, Nick, who passed away in April. Nick wore every one of these tee-shirts, and each one is a special memory. I will be giving the quilts as gifts on what would have been Nick’s 36th birthday, and I can’t wait to see their faces. You do magnificent work and we will treasure these quilts for years to come. P.S. I've already shown them to friends and co-workers and they were equally impressed! You'll be getting more orders! 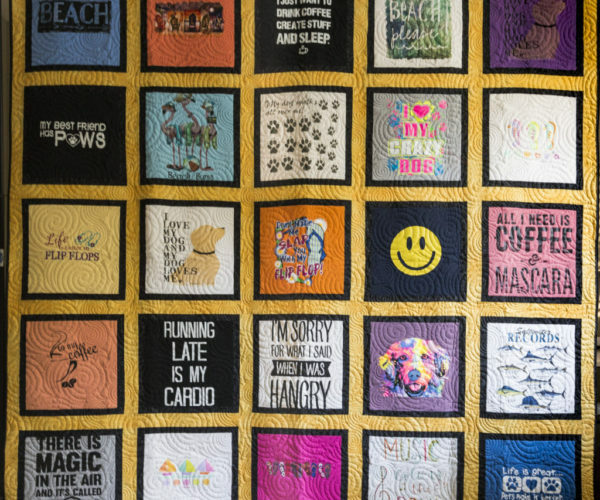 We just received our quilt within the week and wish to convey our sincere thanks, gratitude and appreciation for the outstanding work you did on our quilt. The quilt exceeded our hopes and expectations and really wanted to thank all those that worked on it. We wanted to have this quilt made in honor of our daughter that earned her angel wings much too soon. We know that she would truly be proud of how well the quilt turned out, as we do too. We will highly recommend your company to others. Again, Thank you so very much! 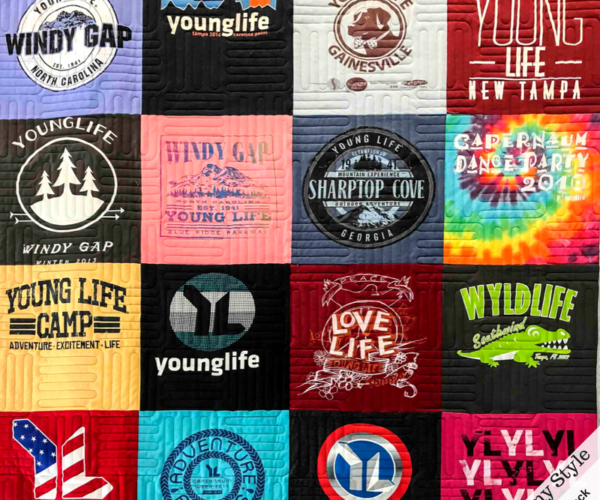 We will treasure the quilt forever. I was excited to open the box containing my daughter's Christmas gift. To say that I was amazed at your artistry is an understatement. It is absolutely beautiful. My husband and I reminisced while looking at all 24 t-shirts, each representing a different stage of our child's life. Thank you so much for creating such a wonderful keepsake. The quilt is perfect, my choices were good, your craftsmanship is excellent. okay, it's long past Christmas now, and I just wanted to let you know what a hit the quilt is. I was just one of probably hundreds of last minute shoppers and requested delivery before Christmas, which you said was likely but NOT guaranteed. You made it, the quilt made it, my wrapping made it, Christmas morning was superb. thanks so much for the outstanding work. My wife has early onset of the dreaded "A" disease, and anything which makes her memory click back to happier days is such a pleasure. The quilt is perfect, my choices were good, your craftsmanship is excellent...thanks again for the great work. she likes it when we talk about where the various t-shirts came from....India, Mexico, Spain, Turkey, Savannah, 30 of them, each one making her smile. Just got ours back. Awesome quality. Worth every penny! I cried when I saw it...absolutely wonderful. It was such a great present and use of my old tshirts! 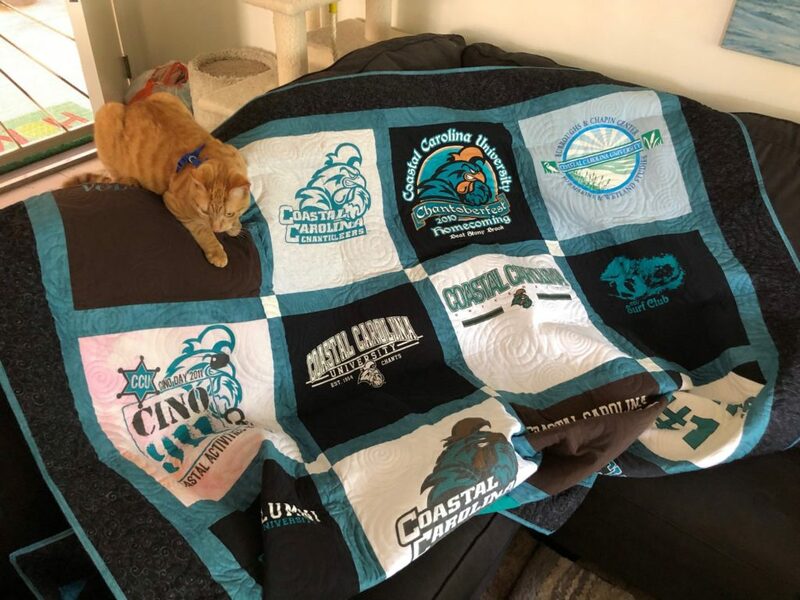 I love my Coastal Carolina quilt! It was such a great present and use of my old tshirts! Thank you for our quilt! She loved it for confirmation and the quality is excellent. I am so incredibly impressed by how wonderful a job Blue Ribbon Quilt Co. did! After graduating, I sent in all of my shirts from college, shirts that held so much sentiment to me. I was so incredibly nervous sending my shirts to a company to quilt them, but I was smiling ear to ear when I opened up my quilt. I can not thank you enough for making my sentimental shirts last a lifetime. The quality and workmanship is excellent! You are design artisans and quilters extraordinaire! My quilt came in the mail today and it is awesome! You are design artisans and quilters extraordinaire! 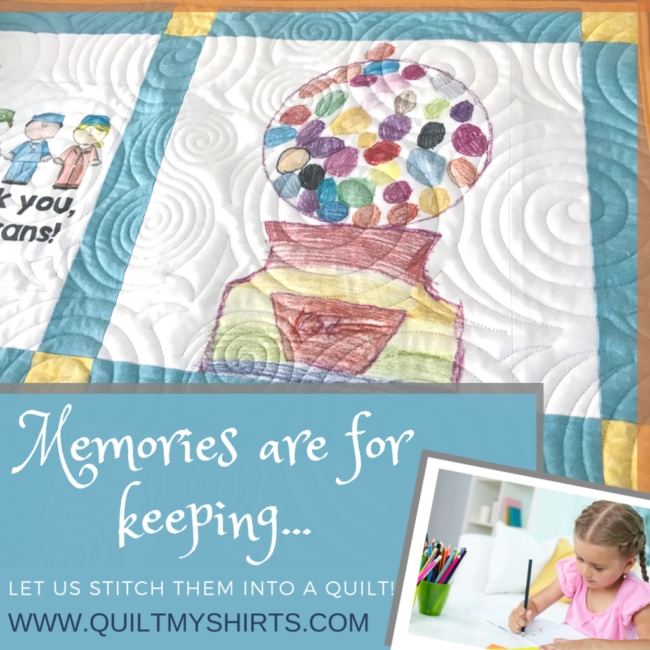 You've turned cherished memories into a treasured quilt and it means so much! Estimated time of completion Wednesday, June 26, 2019 if ordered TODAY! Our economy style is great for those that have a lot of shirts but don’t want a huge quilt. The fabric in-between the blocks is left off making it a little more condensed than our other styles. Great for the budget conscious customer. Our traditional style is our most popular. 2-1/2″ fabric sashing is inserted between the blocks. You have your choice of fabric for the sashings and the cornerstones. Very versatile, letting you design with colors any way you wish. Our newest style is a framed block style. With the blocks cut at just 12-1/2″, this makes a great choice for collections of youth and smaller t-shirts. 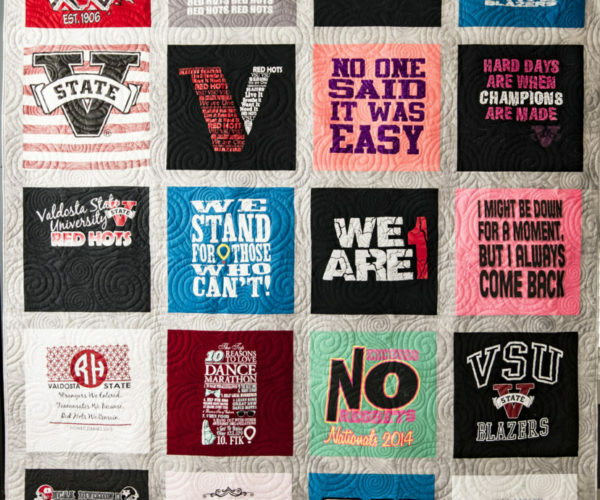 With framing the block, the quilt reaches the same size as our traditional style. 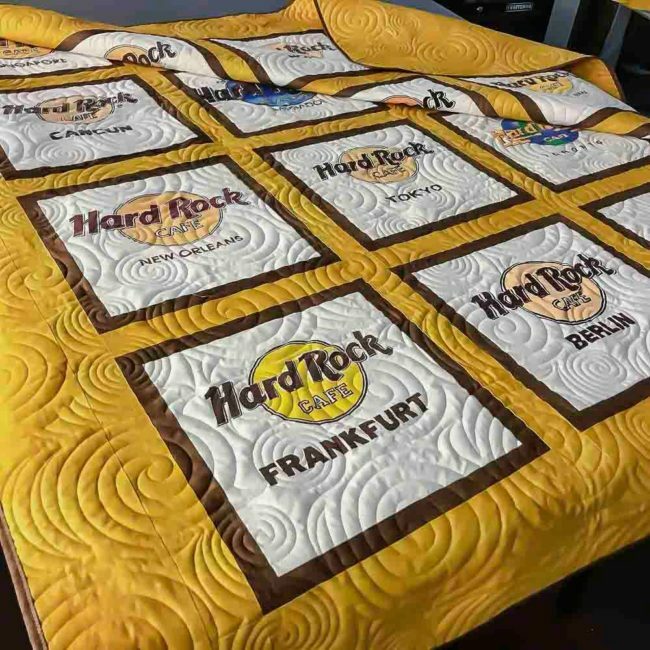 It’s Not A Quilt – Unless it’s Quilted! Do you have tons of T-shirts of your kid’s sports tournaments? Or how about all those 5k and marathon race T-shirts that seem to just keep piling higher and higher in your drawers? Or are you looking for that that special graduation, anniversary, or birthday gift that will last a lifetime? 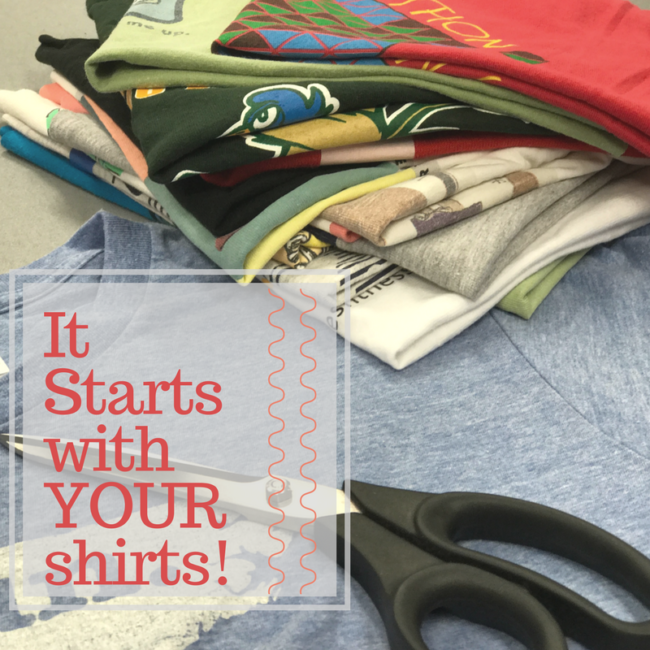 Whether they’re from sports, school, traveling, hobbies, or just quotes you love, chances are you’ve got T-shirts that you’re not quite ready to throw in the trash pile. If only there was a way to give a second life to all those T-shirts and the memories they hold. Well at QuiltMyShirts.com, there is! 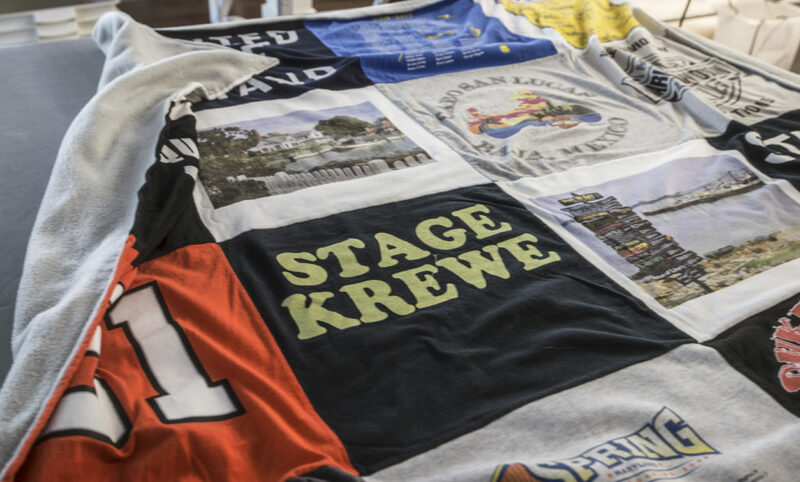 We take your T-shirts and, with the highest quality craftsmanship, transform them into a keepsake T-shirt Quilt that is sure to be treasured for years to come. 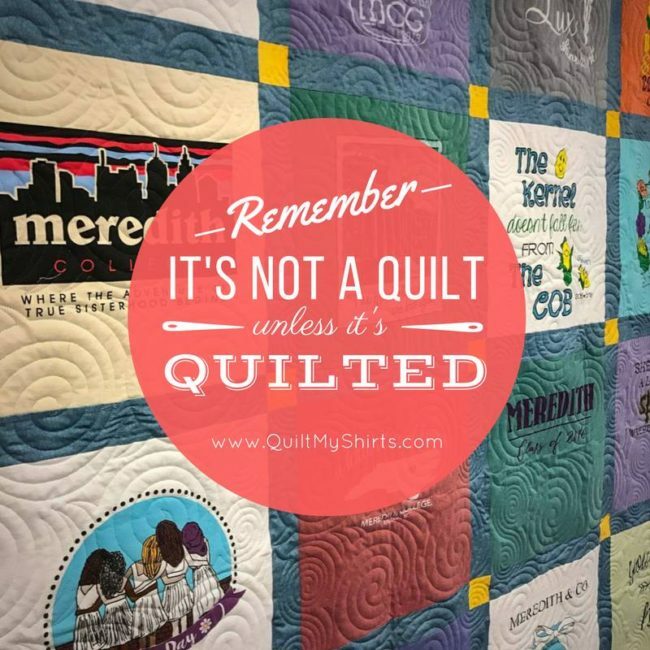 Here at QuiltMyShirts.com we can use any type of T-shirt (or jerseys, sweatshirts or regular dress shirts) to make that special quilt for any occasion. 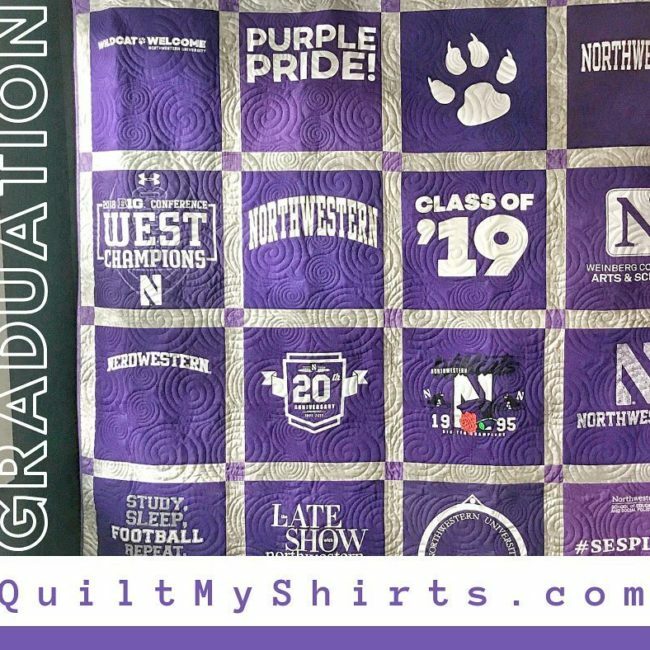 All you need to do is send us your clean T-shirts along with the order confirmation and deposit, and in about 2 – 3 months** time, your shirts will be delivered back to you beautifully quilted into a treasured T-shirt Quilt. “YES!!!! We do use an interfacing on the backs of these shirts. If you’ve been shopping around on the internet, there a few sites that discourage this procedure. The reason they discourage this is because they simply are not selling quilts. 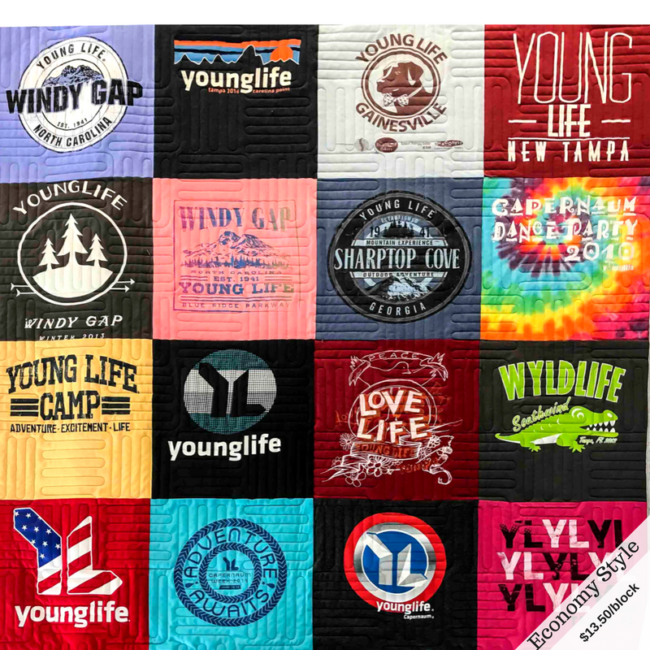 They are selling blankets and mis-leading customers into thinking they are quilts.. With a blanket, there is no batting in-between the layers and no need to machine quilt the layers together. We use a soft interfacing on the backs of the shirts to stabilize the shirt for the quilting process. This interfacing breaks down (almost dissolving) after multiple washes, leaving the quilt that much softer. 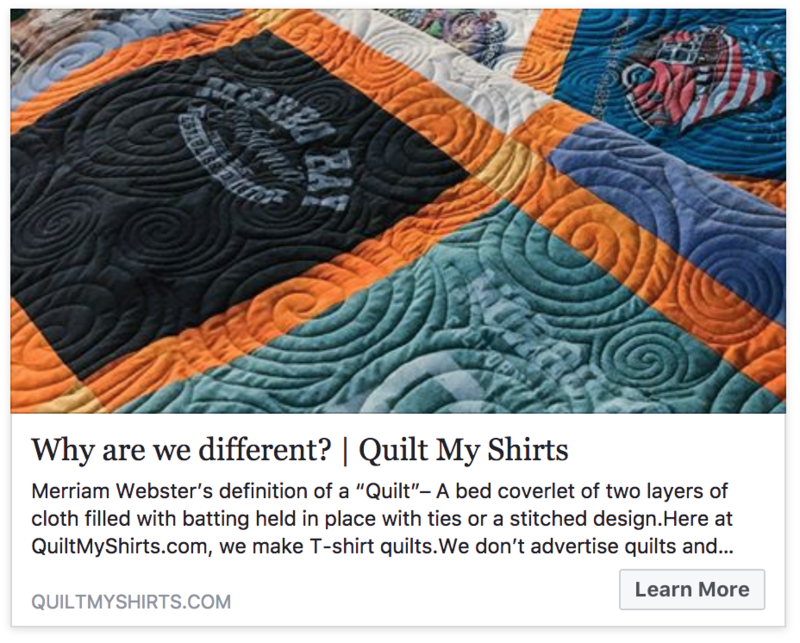 Within the last few years, quite a few new sites have popped up indicating that they make t-shirt “quilts” when in fact they are making “blankets,” discouraging the use of interfacing which has been the standard practice for t-shirt quilts from experienced quilters for years and years. What is the piecing charge, How do I combine multiple shirts into a block ? Sometimes we need to build up a shirt to construct a block . A tank top is a good example or a deep V neck shirt, or if the shirts were precut too small to make a full block. We charge an additional $8.50 per block to piece the block together. We try to use the original fabric from the shirt to make it look seamless. How much does it cost and how many shirts do I need ? Generally it is one shirt per block, we can use both the front and back of a shirt. We can also combine smaller graphics into one block. Cost depends on the size, the style you choose, and any other options you may choose such as Photo Blocks, Borders or Embroidery. Click on the Styles and Pricing page to view. Will you make a quilt out of baby or toddler clothing/items ? Can you make a double sided quilt ? No, It would be impossible for us to construct and quilt it the way we do and have it perfectly aligned. When you make a quilt the back fabric is oversized and then trimmed off after the entire sandwich of a top ,batting and a back are all quilted together. You may find another company who may do it using a hand tied method, or little to no quilting at all . Are you open for drop offs ? 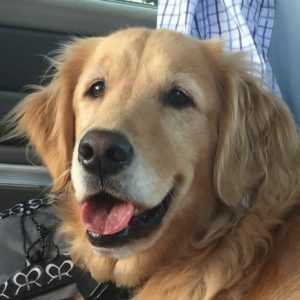 Yes, we realize we get a lot of visitors to our wonderful coastal town of Southport and you are welcome to stop by the shop and drop off your shirts, or if you just want to chat or pet Sweet Pea our Golden Retriever that is okay also. We are normally open for customers Mon-Fri 10am-4pm. we also have a drop box next to the front door for after hours. If you would like an appointment, please contact us through the contact form on the website. 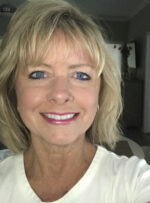 Linda Lawson, is the founder of Quilt My Shirts. She started this business back in 2001 with just a few orders and has seen it grown to now processing over 13,000 t-shirts per year. Throughout those years she and her husband Greg, sold and trained others in the industry, on the use of computerized quilting machines. She and Greg have over 100 systems installed in homes and businesses all over the USA and Canada. Back on 2002, Linda started the first longarm forum community on the internet, keeping the pulse on the industry with their 4000+ subscribed members. 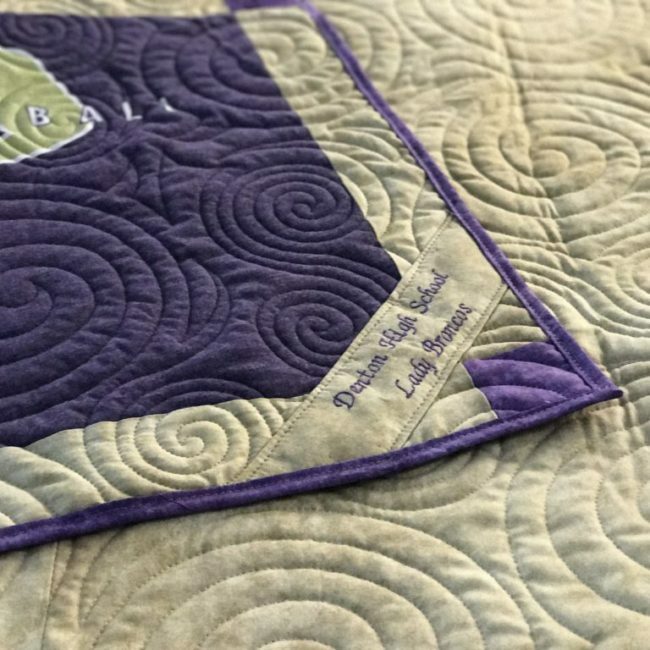 Along with designing and digitizing patterns still available for these machines today, she also taught and spoke at many longarm quilting organizations about the use of digitized patterns on the automated machines they use. 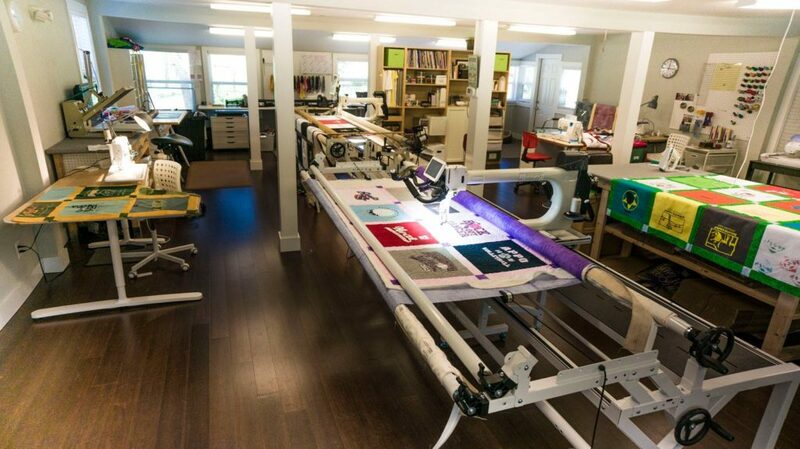 In 2012 she decided to focus on their t-shirt quilt business full-time. 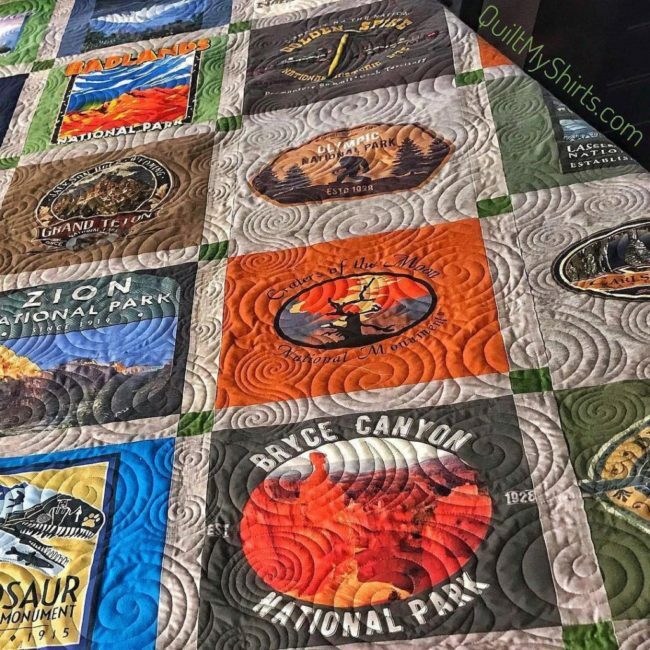 During the last 16 years she has become a leader in the t-shirt quilt industry with her experience and willingness to share the “tools of the trade” with all that inquire. Greg has been involved since the beginning of Quilt My Shirts all the while as a full time employee and supervisor for a large power company . 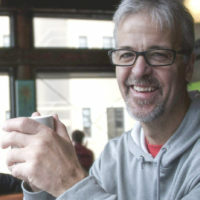 During the past 17 years he has worked alongside Linda as dealer in the quilting machine industry, performing installations, training, support of customers, and working trade shows. After 36 yrs in the electric industry, he decided it was time to retire and join Linda full time at QMS putting his knowledge of the computerized quilting system to work. 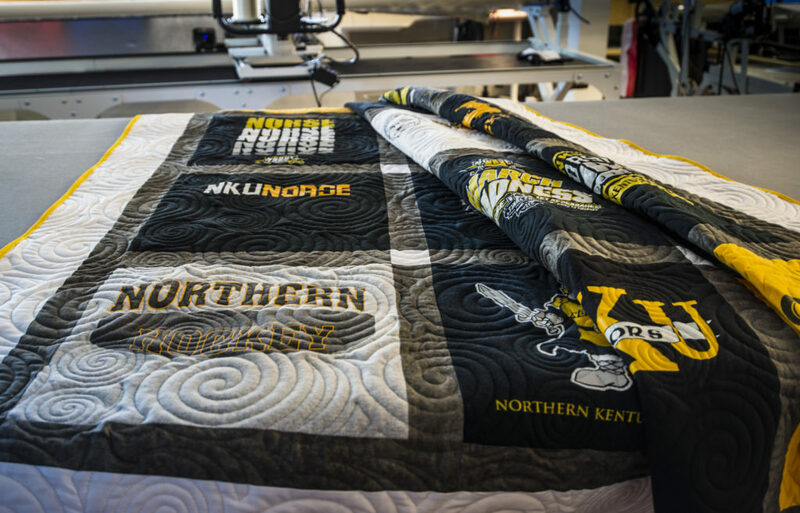 He is a big part of overseeing the daily production of the quilts, and tries to handle the bulk of the communications with customers and their questions .